At long last, the best day of the year has finally arrived – Bruce Day! Time to break out your favourite bowtie (the Gold or Silver Bruce Bowtie would be very spiffy; though you can never go wrong with the sparkly Shining Blue Bruce Scarf) and celebrate the day in fa-BRUCE-lous style! Of course, if you are a Bruce owner like myself, you may have been asked by your Bruce for something a bit different in terms of celebrating the special day this year. With the Games Master Challenge having just wrapped up, my Bruce, Mathemagician, didn't want the super fun and exciting gaming challenges to end. So he asked if we could have our own game challenges, but this time only with games that featured Bruces. Who can say no to a request like that? And to make things extra special, I've come up with a few Bruce-tastic gaming outfits for your Bruce to show off while trying to complete each challenge. So please enjoy this Bruce Day Gaming Challenge! Time to sharpen your skates and hone your jumping skills in Rink Runner. Keep an eye out for the holes that appear on the ice. One misstep in those and you're out of the whole competition. (For some reason, the judges are not too keen on the skating-in-water trick.) Mathemagician loved playing it during the GMC, so it was his first Bruce Day Gaming Challenge request. We both found it fun to play with the sound on, so that you could hear when the notes were caught (helpful when trying for a high score). And of course it's a good idea to practice picking up 2 or 3 notes at a time to get the most points out of the judges, especially in later levels. Gaming Outfit: Ice skates are a must for this champion-winning ensemble. Choose between the Figure Skating Skates and Tights (NC), Holiday Ice Skates (NC), or the Winged Ice Skates (NP). 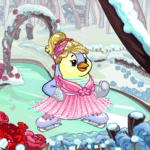 You can never go wrong with the Figure Skating Dress (NC) as your skating costume, but feel free to pick your favourite dress or costume. To help see the ice, it's probably best to go with an up-do, like the Figure Skating Wig (NC). Also consider adding a pair of gloves (especially if it's a chilly day out! ), something like the White Lace Gloves (NP), Ice Cream Machine Gloves (NP), Wonderland Gloves (NC), or Elegant Feather Gloves (NC). Add in the Ice Rink Background (NC), Terror Mountain Winter Background (NC), or Scenic Mountain Top Background (NP) and you're ready to skate on! Bruce Day Gaming Challenge score to beat: 130 in Rink Runner. Arr! Load the cannons! Join Garin and try to defeat the dreaded Captain Scarblade and his dastardly crew members, including the fearsome Benny the Blade. Gain double the points starting in Level 2 when you attack the enemies with a cannonball or the bucket of water. And starting in Level 3, keep those cannons loaded for even more points – though try to douse any enemy fire on your cannons. For the second part of this challenge, you'll join the pirate crew in Petpet Cannonball as you all try to get Petpets through a barrel (shh, don't tell the Petpet Protection League!). 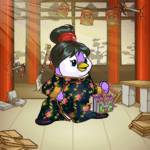 Aim carefully, and try to shoot through the Snowbunny, Angelpuss, and Tenna Petpets, as they're worth the most in points. Gaming Outfit: If you're lucky enough to have a Pirate Bruce (or have painted your Bruce pirate), then simply don the Pirate Paint Brush clothing – Pirate Bruce Bandana, Pirate Bruce Trousers, and Pirate Bruce Vest. If not, then for clothing think about the Layered Pirate Dress (NC), Pirate Dress and Jacket (NC), or the Pirate Knots Shirt (NC) with your Bruce's favourite pair of trousers. For accessories, something like the Luxurious Pirate Wig (NC) or Dream Pirate Tricorn Hat (NC) would be very piratey, and make sure to add shoes or boots like the Daring Sea Captain Shoes (NC). And of course, no pirate ensemble is complete without the Pirate Cutlass (NP)! 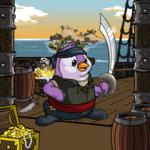 To set the stage, go for the View of Krawk Island from Ship Background (NP) or the Pirate Bunk Background (NC). 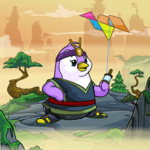 Bruce Day Gaming Challenge score to beat: 1000 in Attack of the Revenge and 600 in Petpet Cannonball. Pay homage to the great Brucey B with a trip to the Lost Desert for a couple games. First up is The Great Desert Race, which was also featured in this year's GMC. For high scores, know that it is a farming game. Before you get to the end of the board, you want to land on the red whirlpool spot right a few spaces before the end (instead of moving both of your players at the same time, move one to towards the end, saving your bad dice rolls for the other one). Landing on the red whirlpool sends you all the way back to 3 spaces before the game of Tug-o-War in the middle of the board. Roll a 3 (use the other rolls for your other player), and choose between the Elephante and Kacheek. Picking the winner earns you 100 points! (If you pick incorrectly, you lose a turn.) Keep repeating the whirlpool/tug-o-war strategy until you get the score you need. You'll need to be on your tapping A-game for Tug 'O' War. The opponents in this game can be quite tough. Tap as fast as you can so that you're not the one falling into the river, especially during the Super Pulls (make sure you hit the right order of W, A, S, and D keys, or mash them all together, before your opponent does). You can choose to play as Brucey B or another player; choosing someone else means you'll face off against Brucey B himself in one round. Gaming Outfit: If you happen to have the Lost Desert Paint Brush Bruce clothing, simply dress your Bruce in the Desert Bruce Wrap, Desert Bruce Necklace, and Desert Bruce Headdress. If not, you can accessorize your Bruce with the Desert Headgear (NP) or Fashionable Lost Desert Wig (NC), the Golden Goddess sandals (NC), and the Lost Desert Team Cuffs (NC) or Princess Amira Collectors Arm Cuffs (NC). For clothing, consider the MiniMME22-S1: Queen of Lost Desert Dress (NC) or Ancient Wrap (NC) (or even the Tropical Bruce Shirt (NP) in honour of Brucey B!). For background options, try the Lost Desert Game Board Background (NP), Lost Desert Oasis Background (NC), or Lost Desert Pyramids Background (NC). Bruce Day Gaming Challenge score to beat: 800 in The Great Desert Race and 3800 in Tug 'O' War. We'll finish up our Bruce Day fun with a visit to Shenkuu. To let your Bruce show off with his or her smarts, join the Shenkuu scholars in testing the spelling of Shenkuu citizens in Imperial Exam. You can be brave and select the "advanced" difficulty (for longer words to check), but "basic" difficulty gets you the same amount of points for correct and incorrect spellers (and has shorter words to check!). Make sure to send incorrect spellers away and not let them through. The game has some random luck to it for a high score – you need a game with a lot of incorrect spellers in each round. Once you've sorted out the spellers, hop over and have some puzzle fun with Shenkuu Tangram. With help from a guide (though feel free to solve the puzzles yourself), you can memorize where all the pieces fit for each Neopet and Petpet. I prefer to play on Normal Mode; once each round starts, I click on all the shapes so they move to the gray box on the bottom left. From there, I pick them up, rotate when needed, and place them to complete the shape. You need to be as fast as you can to get bonus points for the time left on the clock (on Normal). With practice, you'll be the Tangram Master in no time! Gaming Outfit: Two options for this challenge. The first is a bit more studious to match the theme of Imperial Exam. Try something like the MiniMME14-S2a: Summery Shenkuu Bun Wig (NC), the Traditional Shenkuu Gown (NC) or Nightmare Shenkuu Dress (NC); either the Knit Slippers (NP) or the Thieving Boots (NC); and the Bundle of Books (NC), paired with the Shenkuu Training School Background (NP). The second is more puzzle apprentice-y, with the suggestion of reusing the Summery Shenkuu Bun Wig (NC) or going for the Ornamental Shenkuu Headband (NC), paired with the Shenkuu Apprentice Tunic (NC), Cool Bruce Trousers (NP), and the Shenkuu Warrior Princess Boots (NC). Add extra tangram-ness with the Basic Tangram Puzzle Piece Kite (NP) or Tangram Puzzle Piece Kite (NP). Finish it off with either the MiniMME14-S1: Shenkuu Summer Garden Background (NC) or Misty Shenkuu Background (NP). Bruce Day Gaming Challenge score to beat: 1100 in Imperial Exam and 2500 in Shenkuu Tangram. So there you have it, four fa-BRUCE-lous gaming challenges for Bruce Day. May you and your Bruce enjoy this special day, no matter how you choose to spend it. Happy Bruce Day!!! The snow is falling, temperatures are dropping, and there’s a spirit of celebration in the year. That’s right, it’s wintertime! A time for relaxing, giving, and celebrating with friends and family.